Prime Minister Imran Khan's first address to the nation since being elected the country's new premier was broadcast at 9.30pm on Sunday, August 19, 2018, by Pakistan Television. 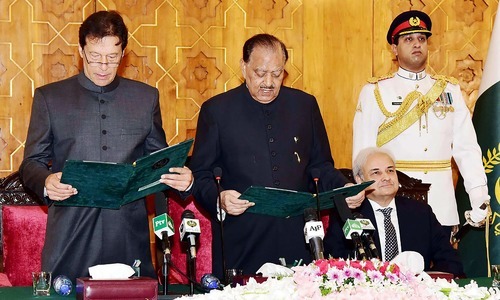 The address — essentially a road map to the 'Naya Pakistan' PM Khan has promised his supporters — began following a recitation from Holy Quran and the playing of the national anthem. The new premier promised wide ranging reforms with a focus on safeguarding Pakistan's resources and their redistribution from the rich to the disadvantaged. He began by thanking those who had stood by him in his political struggle. "I want to thank all my supporters who have been with me on this journey for the last 22 years," he started. "I salute all those who stood by me in my most difficult times; those who bore ridicule to support me ... I could not have been here without you." Clarifying that he had stepped into politics not to pursue it as a career or profession, PM Khan said his only motivation was to help set Pakistan "on the path envisioned by [Quaid-i-Azam Mohammad Ali] Jinnah and [Allama Mohammad] Iqbal." The prime minister then moved on to identifying Pakistan's economic challenges and later spoke about how he would go about fixing them. Foremost on his mind were Pakistan's debt liabilities. "Never in Pakistan’s history have we faced such difficult economic circumstances," he said. "Our debt burden is now at Rs28 trillion. We haven’t been as indebted in our entire history as we have become in the last ten years," he regretted. "The interest that we have to pay on our debt obligations too has reached levels where we have to take on more debt just to settle it," he said. Meanwhile, "our human development index ranking is also in the doldrums" he observed. Quoting from a United Nations report, PM outlined deficiencies in Pakistan's human development, noting that: "We are unfortunately among the five countries where infant mortality is highest because they do not have access to clean water." "We also have the highest rates of mortality for pregnant women," he regretted. He also spoke passionately about Pakistan suffering from the highest incidences of stunting in children. "I have been saying this for ages and nobody took me seriously. We are talking about 45 per cent of this nation’s children. They are not getting proper nutrition. They are not developing properly. They are automatically left behind. What must their parents go through seeing their children in such a state?" he asked. Khan then pointed to the difference in the lifestyles of Pakistan's rich and poor. "I want to speak about how the rich and powerful live in this country," he said. "The prime minister has 524 servants and 80 cars. The prime minister, which is me, also has 33 bulletproof cars. The prime ministers all have helicopters and aeroplanes to fly them. We have massive governor houses and every conceivable luxury." How could it be, he asked, that: "On one hand we don’t have money to spend on our people, and on the other we have people living like our colonial masters used to live?" Exhorting the rich and the privileged to reassess their priorities, he urged: "We need to be compassionate towards our compatriots: towards those who cannot afford to eat twice a day. We need to ask what will happen to the 25 million children out of school. We need to ask what happens to our population. We need to ask how we are to grapple with climate change. "This is the time that we decide to change our destiny." The prime minster then explained he will use the examples of governance set forth by the Holy Prophet (Peace Be Upon Him) "to bring the nation out of its plight." "What did the Holy Prophet do to unite all the tribes living in the Arabian peninsula?" he asked. "What did he do to mould them [the Arabs] into one of the most powerful nations on earth? I want to speak on those principles today. "I want to speak about how we are going to lift ourselves based on that model." "The first thing is the supremacy of law," he said. "The law has to be the same for everyone. "The second thing is Zakat. What does Zakat mean? It means that I spend based on what I have on those who do not have enough. This is called progressive taxation. The rich pay more to subsidise the poor. This happens in Scandinavian countries, where there is good healthcare, good education and justice for all. The disabled, the orphans and widows have support. "The third is compassion. In the west, they care for animals in ways that would put us to shame. The have shelters for animals. Animals fare better there than humans do here. We need to incorporate those lessons. "The fourth is merit. Without merit you cannot do anything. The responsibilities of the ruler entail that they are sadiq and ameen. They have to be truthful . They can have no conflict of interest. The west has these laws. In our country, you see people amassing untold riches during their tenure in power. "The fifth is education. The Holy Prophet stressed education above everything else. After the Battle of Badr, he made it incumbent on his people to attain an education. Look at us today: we are nowhere because we have not followed his instructions." Perhaps realising that he was placing a tall order for his supporters, he said: "You should not feel overwhelmed. We are in this together and we will find a way out together." He then proceeded to explain what he himself was doing towards that goal. 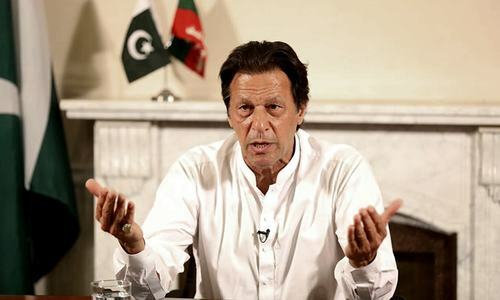 PM Khan detailed how he plans on cutting down his own as well the country's expenditure, saying: "I will keep only two people with me out of the [prime minister's staff of] 524. I will be staying in a three-bedroom house that served as the military secretary's house. "I will have to keep two of the cars because my intelligence agencies tell me my life is under threat. I also wish I did not have to move out of Banigala, but I have been forced to do so because it is not safe to stay there." "We will be auctioning off all the other bullet proof cars," he promised. "I invite businesses to come and buy them. We will put the proceeds of that auction in the state treasury. "I also wish that all the governor houses are kept as simple as possible," he said. "I further wish that the PM House will be turned into a university. It is in a great location to be one. "I am forming a committee under Dr Ishrat Husain to figure out how to cut expenses nationwide," he revealed. He also urged his supporters to adopt austerity measures. "I want you to understand that the money we lavish on ourselves could be spent on those who our state has left behind. Naya Pakistan also requires a 'nayi soch'. We have to think about those who we have left behind." On reforming the financial sector, PM Khan explained that instead of trying to rebuild the economy via external loans, his government will try and fulfill its needs from within. "No country can succeed by taking on debt again and again," he said. "Debts are taken for brief periods of time. We cannot go on the way we have. And you need to realise that when these people give us money, they attach conditions to it. "I will be ashamed to go abroad and ask for money. If the leader of the nation has to go and ask for debt, how will my nation feel? "We also need to pay our taxes. I am going to fix the Federal Board of Revenue on a priority basis. It has lost its credibility and that is why people don’t pay taxes. I will promise my people that I will protect your tax money and spend it on you. "We will keep our end of the bargain, but I want you to pay your taxes too. That is your responsibility. Pay your taxes so that we can lift our destitute out of poverty. "I promise you, if I can assure you that your tax money will be spent on you, we will not face these deficits in the future. God willing, this will not happen again. "We are also creating a task force to repatriate wealth looted from this country. We need to put an end to money laundering. It is our biggest problem right now. "We need to boost our exports. How will that happen? We will need to help export industries. We have made a business advisory council to help address their challenges. "Then we need to boost investment. We need to bring in money from abroad. There is going to be an office in the prime minister’s secretariat dedicated to this purpose. "We need to help our small and medium businesses. They are the backbone of our economy. We need to reduce the cost and difficulties of doing business for them." PM Khan invited overseas Pakistanis to invest in the country and help rebuild the economy. "We need to facilitate overseas Pakistanis," he said. "Our embassies need to facilitate them in every way we can. "I have a special message for overseas Pakistanis. We are trying our best to create a good investment environment for you. We want that you bring your money to Pakistan and park it in Pakistani banks as we are short of foreign exchange. Send your money through official accounts. We need your help." The prime minister said that rooting out corruption will also be a high priority for his government. "I will meet the NAB chairman and facilitate him with whatever he needs," he said. "We will also enact a law for whistleblowers like we did in Khyber Pakhtunkhwa. Whoever helps identify corruption will get a share of the money that we recover. The SECP and the FIA will be fixed on a priority basis. "I have kept the FIA and the interior ministry under me because I want to personally oversee our efforts to eradicate corruption. "I want you all to understand that the moment we start going after corrupt people, they will start raising a hue and cry. They are everywhere. They will come out on the streets. They will say that democracy is in danger. I want you all to continue standing with me. We will save this country or these corrupt people will save themselves." PM Khan said that he will seek Chief Justice Mian Saqib Nisar's help to revamp the judicial system. "The next focus will be on revamping our judiciary," he said. "We have a massive backlog of cases. We will sit with the chief justice and discuss how we can ensure that cases can be wrapped up within a year. We have to do this for our people. "I want to make a special request to the chief justice. There are quite a few widows who have approached me for help. They are embroiled in property disputes. I want to request the chief justice: please, at least for widows, resolve such cases at the earliest. "I declare this as my resolve: the weak who are systematically discriminated against in our country will always have my support." The prime minister said he has asked former KP IG Nasir Khan Durrani to implement the KP police model in Punjab. "We also need to fix our police," Khan said. "The Khyber Pakhtunkhwa police is our biggest success. We won the election because of how good our police had become. The former IG who oversaw those successes, Nasir Khan Durrani, has been asked to help fix the Punjab police and he has agreed. "We do not have the power to do so in Sindh, but we will work with the Sindh government as well to do what we can." The prime minister said his focus will be to improve public sector education as well as madressahs (seminaries). "We also need to fix our education system," he said. "We need to focus on government schools, which are in a shambles. I know that salaried individuals are making huge sacrifices to make sure their children get a decent education. They sometimes work two jobs to give their children the best they can. "We therefore need to make sure our government schools are good enough that everyone can send their children to them. This is an emergency." "We also cannot leave madressah students behind. They too should become engineers and doctors and generals. Why do we not give them the opportunity? We need to do it." PM Khan stressed the need to "fix the healthcare system. It is immensely difficult to fix the pre-existing system. It takes a long time: the Khyber Pakhtunkhwa health system did not start showing results till the fifth year. But we still need to do it. "We also need to introduce the health card all over Pakistan. We have given every household in Khyber Pakhtunkhwa Rs550,000 in case of a healthcare emergency. We should give it all over Pakistan." Khan said that a "water crisis is brewing" which require dams to be built to resolve it. "There was a crisis brewing but we weren't prepared," he said. "We have an emergency. Karachi doesn't have water due to the tanker mafia. Quetta and Islamabad too. "A ministry will work towards saving water. New methods will be taught to farmers. Canals will be lined to save water, while the Bhasha Dam will be constructed at all costs. It’s a commendable initiative started by the chief justice." The PM said that he will enforce meritocracy to restore civil service to its formerly held high standards. "In the 1960s we were considered one of the best in the world," he said. "It is unfortunate how we have fallen behind. Dr Ishrat Hussain is forming a committee to bring merit back. "We will not tolerate any political interference in anyone’s appointment. I just want people ready to work for the nation. "But an ordinary man, when he steps into any govt office, also has to be given respect. This is his right, which he will be given. Bonuses will be given to those who serve people in a timely manner. Otherwise, penalties will also be imposed." Khan stressed the need to transfer the power to the local government, saying: "Power must be given to the bottom-most tier. Nazims will be directly elected in districts, while checks and balances will be kept. "Development funds are given to MNAs and MPAs but the development takes place in baldiyaat." The prime minister said that "jobs must be given to the country's youth. A big project of housing will be started. It will be a one-window operation [create] jobs and [to boost] industries. The youth will be given loans without interest so they can become entrepreneurs. "Cricket grounds have been taken over and houses schemes made over them. We need to build playgrounds and parks for them." Khan said he will replicate KP's billion tree in the entire country. "We planted 1 billion trees in KP," he said. "We will bring our expertise and plant trees all over the country. Karachi has a heatwave as it has nothing but concrete. A large-scale initiative will be initiated to make Pakistan green again." “The menace of pollution has to be addressed immediately as it leads to the spread of innumerable diseases." The prime minister vowed that his government will have compassion for and take care of the neglected and the underprivileged. "Street children are our children, and if we don't look after them who will?" said Khan. "Widows and the handicapped ... we will take responsibility of all. "I want us to develop compassion in our hearts. It's in the animal kingdom where it is the survival of the fittest. In human beings, it [should be] different. PM Khan said he "will follow Medina’s example" to rid Pakistan of its chronic problems. "They did not borrow from Roman or Persian empires," he said. "They strengthened the people and made them self-sufficient. They adopted simple ways. "I will show you that, I will lead a simple life. I will save every penny, I will do no business as my doing so will only harm other businessmen." The prime minister, at the end of his maiden address, told the nation to play a more proactive role in the rebuilding. "I need your help," he said. "When you are being robbed you don't wait for the police to come. You nab them and hand them over. [Similarly], you should help me catch these robbers of the nation. This is the social media age. Keep check on and report such people. We have to act as a team. Help me protect your money." "We have to take ownership and serve the nation. My vision is: one day will come when Pakistan will have no one taking Zakat. If we succeed in our nation building we will offer aid to other countries. "This is my idea for Pakistan. This is the Pakistan I want to see." No NRO please... bring back the looted wealth.. .
Pakistan is now going to march towards progress and prosperity if we only plug the corruption valve from the top and people start working honestly.Please recover the looted money from the corrupts. How he will provide job in a country where average of five child per couple being born in the country? You see five kids dangling from motorcycles everywhere You go.He wants to emulate China then first emulate their population control. His Party is the Movement for Justice, and let us see what is the definition of Justice in his dictionary, as we would expect him to define in his first speech to the nation. Looking forward to hearing PM Imran Khan's first official speech to nation, I am sure, IK will inform us about the uphill challenges that we face after PMLN's miserable performance together with action plan to dispel our challenges. Give IK full five years tenor in government so that he can fulfill his mission and promises! Am looking forward to hearing from our Prime Minister. I think this is the first time in my lifetime I am looking forward to a broadcast of the Pakistan prime minister! Let's wait and see what does he say in his inaugral address to the people of the Islamic Republic of Pakistan? Why another speech by IK, when he has alresdy made twp speeches? Its fine if PTV wants to broadcast this speech.. But in fairness doctrine and equal time for opposition, Bilawal must also be allowed to address the nation on TV.. When will the address start and which channel? It is extempor but it was recorded and now it has been delayed for one and a half hour!! Is it awaiting clearance from somewhere? Today it is a repeat of 18 August. The first address by IK as PM has once again been delayed and interestingly no schedule was announced by the media today. Such delays do not portend well for PTI and IK. We need influence from Imran Khan. Otherwise it will be nothing big change of Pakistan. So the PM cannot even give his inaugural speech on time? Not a good start given that people are so eager to hear him. Should set an example for people. No nation can progress without time punctuality. So far very disappointing. In Japan, if a train is delayed by one minute it becomes major news. I can't imagine a Japanese or German head of state saying '8pm ... no 9pm ... no 9:30pm'. Time is crucial, as the economy is dwindling. @M1 Jamal Earlier Pakistan wasnt marching, then what is CPEC. Same delay like old Pakistan. Oath ceremony was one hour late and now 8 PM has changed to ?? IK needs to lead by example if he want to create disiplin. @Attorney Tausif Kamal, You are right. In fairness, Bilawal must also be allowed to replace IK immediately and his father must be made president again. Imran doesn't seem to be a stickler for punctuality. Perhaps a window into things to come - over promise and under deliver? He is going to tinker with the system just like Musharraf did and in the process damage the system beyond recognition.We inherited Civili and army institutions from British & we have instead of eforming it ;disfigured it. If proper accountability begins, do we have enough space in jails to keep the convicted felons. Not impressed by his speech! What’s going on IK? No a good speech by IK. What’s going on IK? Wishing and hoping to see a peaceful and prosperous Pakistan. Let both our countries focus on uplifting our masses. The rest of the peripheral issues can wait forever! Simple yet a great speech. Being from India, believe Pakistan has got their man (like US got Obama and India got Manmohan Singh)...Hope the country allows him to implement what he said, politics can still derail him; unless people stand up for him. I hope everyone give him all the power to change Pakistan. @Dr. Salaria, Aamir Ahmad - You forgot to say: "Keep it up, and hang on tough." Appoint a genuinely fair and impartial committee to fully understand each Head of Account requiring Provincial and or Federal Funding! Work on only immediately important Heads of Accounts, such as Health, Education, Developments of Agricultural Lands, Developement of Industries and Infrastructure, to get positive results within shotest possible time. To attain such an aim and objective, remove Rotten Eggs, to doaway with Bottle Neck, Red Tappism, Bureaucratic approach, by bringing in meritted persons of real academic education and positive and constructive experience of long years in the given field of assignment! This in ultimate analysis will reduce by say 35% use of black money for bribery and corruption in Government Quarters, requiring the notorious money holders to find an alternate to consider fate of remaining 65%. The cycle could or may help the government in a way to get the legal process on war footing for recovery from Foreign Banks. Nice and honorable words from Imran Khan. The destiny of Pakistan will change only if all the citizens are in position to get proper education and health service and are treated equally by the government in power. So time has come to put to end the VIP statue, no more police protection for the elite. All police resources should be utilized for the protection of general masses. All the corrupt elements in the establishment should be removed and persecuted and their illegal wealth confiscated. The carrying of lethal weapons by the citizen should be prohibited. The infrastructure and roads be repaired and a good transport system initiated to save fuel and foreign exchange. The above will bring prosperity. Another issue is the large army for the defense of the country. What we need a modern elite force assisted by the people army, which in times of peace work in the field to grow food for the nation and at the time of war join hands with the elite forces to safeguard the motherland. "Action are louder than words". Every ruler says words and promises. Now we want to see action not just words. Remember Gen. Zia used bicycle but it could not change the fate of nation. @Attorney Tausif Kamal Please....that was a very lame joke. Absolutely beautiful! Lets get going. We Pakistanis will send you those remittances pronto. Guard my money! Guard my country Imran! Time to go after the corrupt! @Socrates right now he has addressed internal infrastucture-type issues. punctuality IS important, but NOT the most important. Nice speech - now need action plan. Just the speech I wanted to hear. What a difference it makes to have a educated person at the helm instead of uneducated, fuedel idiots. Its time for rock and roll. Produce as many jobs as possible to overcome crime, corruption like issues. The more population the better is for any country. China and India are examples infront to us. Simple life style, price control and than implementation of low taxes, young generation to put into power, old fellow to go home, no NRO, Marit on every department, new Police force, check and balance of Govt. Institutes, formation of new departments to check and balance the situation. Corruption is everywhere, demolish Corruption and make Pakistan greate again. Mr PM,What is new? What is the way forwar? Sir, we waited and waited for his speech. I hope 100% that this government will deliver it. But it seems to achieve this, five years is not enough for them. Well done Khan. You made us proud! Looking forward to a better Pakistan!! You have got 6 months to win the trust of People of Pakistan. we will start your accountability then. Best of luck. In my view, Imran Khan covered important issues related to corruption, education, health care, justice, recovery of looted money, reforming police, FBR and other institutions, etc. All are uphill challenges that can be handled with dedicated, honest, hardworking and capable teams - this is achievable through bilateral efforts, being united against corruption and other evil mindsets, etc. Please contribute positively and be part of change and new vision! Were you listening? Or are you those that expect to be handed things on a plate? IK needs to pressure NAB and other agencies to expedite their cases against PPP corrupts leadership and their cronies at any cost and recover the money they had looted The great thief of them all, Mr. AZ, should be caught and punished, for their is a history behind him. Imran needs to show guts to fight the organized and corrupt gang of PPP lawyers with over over forty years of experience protecting crocks and thieves. Please commentators IK has touched all current issues Pakistan is facing. Let us not too critical as there is no easy solution. Pakistan has been a place for all leaders for the past 60 years to looters place. PPP and PMLN has filled their in Pakistan and overseas bank accounts by stealing from our most vulnerable and poor public. Heard full speech, live, courtesy Dawn. @Attorney Tausif Kamal why? has Bilawal assumed office as PM? I'm sad to say I have never heard a speech so full of pious platitudes and hypocrisy as this , today. It did not say anything really worthwhile at all. Firstly, where is the self accountability that Imran promised? He should offer himself and all his party's elected members for scrutiny at various levels, by the public- indeed, he will find a vast majority of crooks and defaulters in his own ranks. Also, he should stop being stupid and emotional, there's no need to throw away valuable state assets such as the PM and government houses etc. If he wants to improve universities, existing ones are there, they all need to be upgraded; if he doesn't want to live in the PM house, use it for government offices, we can save a lot of money on rents being paid for such premises in Islamabad. Finally, he talked about many budget cuts but what about drastic reduction in military expenses? He didn't mention the military even once. A total flop. What a speech. Captain you scored a century on day 1. Absolutely memorized by your determination. Hope you are able to execute your vision. Love and respect from a oversea Pakistani!!! Quite an impressive speech.First Prime Minister of Pakistan who has given a totally informal speech.He is truly a combination of Mr.Z.A.Bhutto and Mr.Jinnah in him.Congratulations and Godspeed on your endeavours. A laundry list of ideas blended with a lot of wishful thinking. Good luck Mr. Khan! People must help this agenda. Even if we sacrifice a small percentage of what imran has sacrificed for this nation, we will overcome the dire state we are in. @Attorney Tausif Kamal mr wasn't 30 years enough? You see now there is something called a smartphone. People playback the promises made by the sharifs decades back, which they did not fulfil. You should invest in one. No nation can change their fate until they don't change themselves. There are two parts of a state 1, the leaders & 2, the nation. It seems 1st part of this state has vision and will to change. Now it is up to the second part that whether they want to change their fate or not. IK, thank you for providing a clear vision on day one for Naya Pakistan. We (American Pakistanis) are ready to play our role. We all will love to bring our expertise & investment to Pakistan provided your plan to improve the security and eliminate corruption in Pakistan is implemented. PM Imran Khan will reduce above 500 staff persons to only 2. My question is what would the discharged persons be doing after this? Immaculate and amazing speech. This man has the willpower and capability to transform Pakistan and pull the nation to greater heights. We need get Nawaz's stolen wealth back. Can you put all those ideas into actions?? Do you have people who believe same as you do??? Cabinet not selected on merit. Ali Zaidi, an IT expert and entrepreneur who founded several profitable IT companies was passed over for minister of IT portfolio of which was given to Khalid Siddiqui who by his own admission has rarely used a computer in his life. The reason is the upcoming spectrum auction and probable opportunity for kickbacks. Nawaz increased economic growth to unprecedented levels, controlled inflation, got out of electricity crisis and strengthened basic fundamentals of the economy, give him credit for that, truth needs to be told. It was because of Khan and his backers that the national economy tanked by much more than the 65 crore that Nawaz spent on his trips. Household economics and national economics is different. Khan's handlers wont let him do anything to bring the country in order because if he succeeds their house will be in disorder. That is why they are a state within a state. Excellent speech and brilliant vision for the nation. Population control decreases automatically as soon as country becomes prosper. Look at Qatar population , only 1.8 per family. It’s because they became richer , they used to have 8 kids per family. I crossed my fingers to see how lavish will be his first foreign visit....!!! @Bullar Shah Is this how you will support IK? Sorry for you. Extempore comes from the heart, nonetheless State Address should prudently be scripted. @Attorney Tausif Kamal Bilawal? The stage is occupied by a better people now. @Attorney Tausif Kamal you call your self an attorney, really. Watched the addresses of many leaders to the nation but this one was surely different..it was totally a road map how we're going survive and develop in upcoming days . We have to bring change.. so we have to change ourselves first .. we're with you ik.. please don't break the promises you have made. @Umardaud Time to take off the tinfoil. @Nawaz are you commenting from Adiala! Is Imran going to have independent audit teams of Technical Gurus of expertise in each area of different parties to check implementation in right direction? @Janikhel Of all the issues we have to tackle, this is what concerns you the most? @Nawaz They have internet at Adyala? Salute to our New revolutionary PM MR. Imran Khan for his historical first speech. I do not have a inherent inclination towards any political party in Pakistan. However, IK based on a proven past track record has my vote. He is a clear choice for Pakistan and its people. For those that are supporters of PML-N, PPP and MQM, while its fair to support whoever one may support, but in this case it is simply unfathomable to consider any of these parties based on their dark history and corrupt leaders. I also see some people whining about late speech and too much speech. These are the type of people found in every nation, but the mases should not lose hope when they see examples of such kind. We have a bright future ahead. @Nasir A. We have other bigger problems to worry about then punctuality. Blaming everything on the PM is easy but makes no sense in this case. If looking to simply blame someone...blame NS and Zardari was eating this country's flesh for so many years...maybe your vote is to be blamed for that only if you ever voted for the criminals. @Sumit look at the comments of the pakistanis, they themselves are not punctual or clean but are criticizing Imran. Problem in the subcontinent is that we are NOT willing to give up corruption. The visionary leader has detailed his mission and how to implement and achieve it wIth the help of the common people. I wish that everyone with him is sincere and loyal to Pakistan. Mr. Imran Khan, PM of Pakistan has spoken in his first maiden speech from the depth of his heart. He is a revolutionary political leader who is struggling to change the fate of the country. Hope his vision will be implemented by his subordinates in PTI as well as in government departments for the well being of the country and for common Pakistanis. Only plantation of trees is not environment. His government has to take the holistic approach. I did not see anything on sanitation. I like his speech...I think we are in good hands..I will invest in pakistan...we need to make pakistan one of the best nations on the planet. if every Pakistani helps we can do it. Now This is my PM Imran Khan. @Naz Wawas - Change starts at home. He promised things what other leaders never dared to speak of to the nation. Let's start by changing our mindset and support him, shall we? IK should follow some basic principles I.e., 1) time punctuality, 2) do not accept Gifts from friends 3) the appointments of Ministers or important positions should not be made without investing his past. What a leader. Shame to pml-n and ppp. What s speech by a true leader. NS would have never delivered such speech. I believe in everything PM Imran Khan says. Even if he only achieves 25% of what has been said or promised, it will be far better than what previous looters have been doing. There can be no disputing most of the points made by IK in his first speech as PM. However, it remains to be seen how things turn out in actual practice. It will be no easy task, except for the curtailing of the government expenses on the maintenance of the palaces of PM, President, governors etc. plus some bureaucrats' official residences, which they can do quickly in the short run. However, he seems to be a little confused on the economy as well his vision for Pakistan's polity. Nevertheless, a good first speech as the chief executive of the country. But with no change, apparently, in the overall approach towards the economy, judging from his choice of Asad Umer and Dr. Ishrat Hussain as the Minister and advisor respectively, there is little hope that any major change would be brought about. His idea of reinvigorating government educational institutions and hospitals is correct, but this will clash with the neoliberal approach of the concerned minister and advisor. @M. Emad you have to be sophisticated to understand what someone is saying especially when you are jealous and sour. Imran is a Prince. Loved every bit of it. The tilawat, to the man from ptv who introduced him. He couldnt stop smiling. Wish Imran a long long life. In my view, Imran Khan covered important issues relatiñg to corruption, education, health care, justice, recovery of looted money, reforming police, FBR and other institutions, etc. All are uphill challenges that can be handled with dedicated, honest, hardworking and capable teams - this is achievable through bilateral efforts, being united against corruption and other evil mindsets, etc. Please contribute positively and be part of change and new vision, so that our future generation is proud of us! @Jk Good point, population control is a must otherwise related problems just keep multiplying. Awesome speach. Heart touching. Absolutely good direction , justice for all and compassion for the poor. A real Captain motivating his nation and honesty is his asset. The ultimate goal is Qaid e Azams vision of Pakistan, an Islamic welfare state that helps all. Absolutely leader like. Man with a mission. Join in Pakistanis... there may not be a better chance in the foreseeable future to reclaim your sense of direction. Citizens, the Prime Minister has arrived! Excellent speech by PM Imran. For all those who doubt implementation of his vision, give him 5 years. Pakistan would be a lot more different at the end his term than it is now. It will be not easy, it will not be fast, but there will be betterment for the country and people of Pakistan. @k k tiwari well I think that IK needs to correct Pakistan internally by keeping a very low peaceful profile internationally. I think that’s exactly what he is doing. @Attorney Tausif Kamal - Why "equal time for opposition"? Are you still in elections mode? Being an Attorney you should know better! @Asad please get your facts correct. Naw ax and clan used to bribe for getting electricity when they wanted to boast. And that is also only in Lahore. If they had corrected the energy crisis, people wouldn’t be living in dark. Plus he spent public money on his trips to save his back from Panama drama... are you listening to what you are saying???? Overseas Pakistanis will help but they need substantial assurance about the safety of their assessment. When bank rate is 120 to a dollar and they are given 110 at a bank, this does not speak well. Get rid of private money exchange firms. Around 90% of their pounds and dollars end up in Dubai in money bags. Let people change their foreign currency at banks only, and make sure those banks are held accountable. There are tens of thousands of these money exchange firms in Pakistan, where tens of millions change hands every day. You can bring all this into legitimate financial trade really quick. @Asad I think you will find Nawaz achieved growth of 5% by borrowing and spending which is lower than the 8 to 9 percent Musharraf got in three years in a row. Now count down has started to walk like he talked. a lot of prayer and best wishes for newly elected PM to stand by his words. The new government would also have to address another fundamental problem. The ever growing population. There should be well placed programmes teaching people about that. Iran introduced some good measures after Iraq war and brought the population growth from 3+ percent down to 1+ percent in 15-20 years. This is what Pakistan needs. Otherwise any growth in economy would be wasted by an equal growth in population. PM Khan may be able to sort out pakistan's problems if nobody interfere with his missions ! @Asad Sir, I an not convincef you know much about the economy of a country and the blunders Nawaz Sharif's personal accountant ishaq Dar made to the economy. Projects built by loan money, subsided by the government, how do you pay the interest? Yes, other projects. But then there is Chinese investments, with guaranteed returns of 12-17% over the next 20-30 years. They would be a stupid not to take such offers. Ever wondered why a country like Greece, on the verge of bankruptcy, was able to sell Euro bonds at 4.5-5.5% interest, but ishaq Dar sold the same at around 8% around the same time, for a macroeconomically stable and growing Pakistan? These are some thought provoking questions. Please think about them. @Attorney Tausif Kamal Who’s Bilawal? Very noble thought. A far cry from bling-bling of PPP and show-off French designer flaunting Maryaam Sharif and Bond Street addict, Nawaz Sharif era. Hope people will flash less and care more. @Attorney Tausif Kamal That is a ridiculous suggestion ! I am on bed cannot sleep and just thinking how I can help my country get out of this huge debt of 28 trillion. PM house should be turned into museum of democracy/political history. No words about Information Technology. Unfortunately our PM and his team are not aware of the value of software technologies. This is the quickest way to bring change in common man life. As a new Prime Minister, I would hope Imran would get his facts straight. Pakistan does not have $28 Trillion debt. It is one-third of it. Mr Khan has a tendency of making things looks with incorrect facts. Yes, Pakistan has a very large dept. But let's not distort the facts. Economic recovery is the most important thing. I just do not get it there he is getting the numbers from. Now do it, talk is not enough. If Imran Khan implements what he said in his speech, then indeed we will have a new Pakistan and real independence from the British Raj. I hope and pray he is true to his words and then he will be my hero, he will be our hero. The projects mentioned in his speech require at least100 billion dollars which the country does not have or can not get. These ideas make people happy. Will they see these Projects in their life time. I doubt it very much. This reminds of a Z.A Bhutto,s promise of Roti, Kapra and Makan for everybody. All the young and the old voted for him and took their dream to their grave. Great speech. But most critical thing is everyone should now fully support. There are many powerful people in every mohalla of Punjab who want to always fight against anything that is good for nation. @Attorney Tausif Kamal and tell us what ? I am grand son of Bhutto and son of benazir that’s all he has to his credit plus a British accent ? What else and in what capacity he should be allowed ? Is he a PM ? CM ? Leader of opposition? Or just Zardari’s son ? Whole nation prays for your success. This nation need help. That's it in a nutshell. Compassion for the poor and strict austerity elsewhere. No mention of minorities. Especially, the one’s being persecuted and marginalized since Zia’s regime. Any nation who doesn’t have tolerance and honesty can not be able to progress in any shape or form. @M. Emad You always make unintelligent comments. How is it dull? Can you give me ONE example? Very noble speech - let's hope he delivers! This is a dream of Khan Sahib. But it is possible, let us try to make this dream come true. can try. He will walk the talk. A very commendable road map to tackle very difficult issues the nation is completely bogged down with. I wish he should have spelled out the way & means to contain the acts of terrorism which if brought under control will provide a lucrative impetus for foreign investment. This requires a huge and concerted undertaking and besides our neighbors, all other nations are closely watching us that how we handle this hydra in the first place. Unless that is not convincingly done, attracting foreign investment will remain a piper’s dream. Another issue of concern is present dire state of public sector white elephants such as Steel Mill, PIA, Railway, Wapda & other alike, which has created 1.3 trillion in losses so far & adding on. The austerity program announced must culminate in revamping of government departments which are flooded with political appointees. The nation needs a small, efficient & vibrant government machinery capable of delivering. I, for one, wish IK success in his endeavor. Excellent opening ! let all Pakistani help pm Imran for a winner like 1992 world cup. @Patriot! I second you. She has missed that Omni present funny advice this time around. Let us keep our fingers crossed as we may be lucky enough to hear that worn out quote once again. @Ayesha K Sadozai maybe total flop for u. But we average pakistan love these measures. Potwaris can cry all they want for the next 5 years. Thank you so much. I wish your every success. You are working for humanity. @Wow I endorse your very well composed comments. He has diagnosed all the ailments nations is bedridden with and for sure cure would be forthcoming. I have no doubt about his sincerity and will to move in the right direction after all these years of plundering and poor governance by his predecessors. I am sure that our youth who have made this change in approach possible will make all endeavors to accomplish it. @Khaja give him a break Khaja saab, u want the destruction of 71 years reversed overnight. Give him some time my firend. Even a magician comes on the stage with a plan. IK has no plan and is still speaking like he is on the campaign trail. I was looking for a road map. Or someone just handed him the wrong parchi! Admire his ideas and objectives. Need real action plan to implement them. @Attaullah - Thull what are u implying, he adds another 500 servants and claims he gives job opty. What Imran doing here is a good thing isn’t it. Our new PM spoke at length, yet there was not much that was new or innovative , in this speech. One thing that the PM and advisers keep on repeating, is the role of 'expatriate Pakistanis' and their remittances etc. However, I wonder how sustainable foreign long term investments and remittances would be, as levels of economic migrants from Pakistan is coming down, not growing? It might be wiser to try to simply focus on (a) increasing and improving various types of tax and revenue collection in Pakistan (b) at the same time developing our own industrial productivity and trade exports and (c) implementing strict austerity levels. Look at Greece, how they have recently moved out of debt through such efforts. I would strongly urge the PM to start a major tax collection initiative from his own party members and spread out to all the nation. Also, he didn't mention this , but it is absolutely vital to half the military expenses of Pakistan, at once. He looked and talked like a normal Pakistani he looks like a some random like simple person I talk to in my local dhaba beautiful simplicity. Pak Diaspora abroad don't forget about Pakistan, we need you now more than ever. splendid speech, honesty dribbled in IK speech. bring in fresh faces, we the people do not wish to see the same corrupt people in govt. offices, from fbr, police, and every where else. @k k tiwari he did gave a statement.. simple sweet and straight forward -peace ,only solution. PM Imran Khan has set out an agenda that a common man wants. Difficult to achieve but not an impossible task.Steadfastness is the key. Great news to stamp out lavish living & wastage of public money. Poors of Pakistan deserve to survive rather than live in abject poverty forever. Great speech which has made everyone speechless. Captain clean-bowls himself himself out. @Jk You are wrong. This is not issue at all. Did west control their population? no, families there even 7 children. Stop corrupt and all will fall into place. @Attorney Tausif Kamal In which capacity ? “Karaz Ataroo, Molook Sunvaro” slogan was floated in 1993 by NS and overseas Pakistanis sent millions. I want this PTI government to investigate where that money was gone. I know many overseas Pakistanis when they visit Pakistan, they always return with horrible stories of treatment melted on them. At least treat these overseas folks with some respect as they are the ones still contributing $20 billion a year to your economy. The construction of Bhasha Dam is already set to start; LOAN of trillions of rupees is just awaited from World Bank etc. PM should tell the real story. Best wishes to Mr Imran Khan and his team. Hope you build a strong healthy and happy Pakistan and we live peacefully together. Every PM successes graded by their ability to improve Pakistan, major criteria is uplifting the main city Karachi; if things go bad in Karachi, so goes down the ruling government. Good words. Let us see how he implements what he said and most importantly when. Also he did not mention of the sacrifices of our forces and their interference in politics and into other institutes, their out of scope businesses like housing schemes, fertilizers, cements, expensive and beyond reach education institutes etc. People want to see change from day one. He has magic wand for corrupt nation, who doesn't pay tax and looted by corrupts for ages. @Attorney Tausif Kamal Who is Bilawal ? @Attorney Tausif Kamal are you really an attorney...the nation is in crisis and it needs constant feedback from the pm that is how it is here in usa. Best speech I have ever heard in my life. Another problem he should have shed light on is timelines. Along with cleanliness and education, this is essential for a nation’s character building. Tardiness is rampant in almost all part; people don’t show up for work on time and end up staying late, wasting precious energy and quality time which can be used in doing something meaningful. And let’s start with the top; he was 90mins late! I am with you my leader. The first change came in my behaviour in naya Pakistan is that I didn't break any traffic signal today. @Javed that’s pretty senseless generalization.... you deserve NS/ Zardari reading from script and picking your pocket. All the best to Pakistan and Imran from South India. I hope he is sincere and he succeeds in all his laudable goals. I pray that Pakistan becomes the shining star of South Asia, for all to emulate. Enough of the dark shadow of Zia ul Haq. It's time to walk tall in the sun. If only we would think that there is a tomorrow. The honorable PM has a lot on his plate will need several terms to complete all. It was Imran's good speech to the nation. The common people of Pakistan are suffering very badly since the inception of the Pakistan but they are passing their miserable lives for the last more than 15 years. During these 15 years PPP and PML (N) was in power and they were totally failure to deliver and even pass some relief to common people. The Permanent Plundering Party of Pakistan & Pakistan's Money Laundering Party were looted with their both hands and another side handful tax payers in the country were worried and decided to evade taxes. I shall remind to IK that I read a management book written by British Author who has written "there is big difference to say a job and to do a job". It is requested for the interests of the masses in Pakistan if PTI may deliver 10-20 % of their manifesto announced before the election and yesterday's speech of Imran Khan then they can easily complete their 5 year terms. Captain Imran makes history ! Clean-bowls himself out on first bowling of first over of first test. Well, it was a very impressive and motivational address which was focused only on welfare of the state. Imran Khan has now got a gigantic task ahead of him to fulfill the promises made to the people. Best of luck to Imran and his team from across the border. But the question what accounts for major share of the budget each year? You got work on that, else things will continue as usual. Mauritius salutes the maiden speech of Imran Khan. Very inspiring, down-to-earth and coming from this position of power ,is bound to have a cascading effect on the entire nation,in particular the extravagance. Banigala is many times more expensive than the house he will live in, perhaps even more than the PM's house. Empty gestures will not solve this country's problems. @Ayesha K Sadozai first shed away biasness you owe largely and then comment fairly. . Please give me freebies subsidies. have compassion, adopt austerity and pay taxes are the three key lessons the premier had for the nation. its time ptv needs to have a proper set instead of a poorly printed background! @saber "People want to see change from day one. He has magic wand for corrupt nation, who doesn't pay tax and looted by corrupts for ages." Nobody in the world PAY taxes. Those who TAKE taxes rule. Currently taxes are TAKEN by corrupt mafias in form of bribes or extortion, so they are ruling. If Imran wants to rule the country, he has to take taxes, whether someone wants to pay or not. If he succeed, which means eliminate those taking currently, he'll ascertain his rule and thus will be able to implement his agenda. Fixing health, education, law & order will be easy, no need of magic wand. Some of these comments are unbelievable. Our PM highlighted feeding the poor, giving clean spaces to the youth, offering low cost healthcare to all Pakistanis regardless of their wealth, holding all politicians to account. He addressed every single crisis that has held Pakistan back, and he promised to dedicated all his energy to overcoming them. But his speech was 90 minutes later than planned, so that's the end of Naya Pakistan. Are you people serious? @Ahmed bhai jaan Bani Gala is his private property. He is talking about saving tax payer's money / awaam ka paisa. Khaqan abbasi lived in his own house rather than the PM's mansion. Nawaz Sharif paid for it's expenditures himself rather than the taxpayers money. That in itself runs into millions. The new pm would not believe it until he was shown the proof. He should take steps towards 'LAND REFORMS" by taking lands from those Landlords whose Grand parents/ Parents got them by siding with the British. India did it right after independence. East Pakistan too did it the. This Action will solve Financial, Social, a, other evils caused by these enormous wealth and power of these Landlords. Education/ schooling of villagers will become easy step. In order to strengthen the rupee, the proceeds from the auction of PM car fleet should be in dollar. The same rule should be followed for all such imported items to be auctioned, in future. Speaks too much. Unfortunately, such speakers do little. @jamshed Bravo. You said it loudly and clearly that if there is will there is always a way. IK by all applied standards is educated, honest and focused. All he needs is a good, dedicated and honest team to deliver. The country's youth who have been suffering all these years, due to corrupt and self servient rulers, do see a ray of hope and would definitely go an extra mile to give IK much needed support enabling him to fulfill his tall list of promises. It is easy to spell out national issues which even a common man full comprehends, but the real test will start when he put his hand on beehive nest. We have to show resilience and patience as things may not unwrap so easily & may face utmost resistance from forces who would try tooth and nail to maintain status quo. This being our last chance & one can hope that initial failures and sluggish outcome of efforts may not become a source of frustration for those who want overnight results. Even 25 percent outcome would be great achievement. If you visit a sick friend whose cough and cold having turned into a terminal lungs cancer because of the mishandling by his corrupt caretakers, what you should do? Should you tell him that very sa to know that now you are left with no option except death. Such negative approach may rather cause the patient death before the estimated time. But if you give the patient hope and strength by telling that under care of your new doctor I am positive you will get well soon as already many have been cured before. This will be an option in favor of. the patient. The majority of the long suffering, neglected, exploited non-privileged and simple minded people get happy by few words of hope from new coming leaders and been living on that since their forefathers. They are used to it. Hence please let them enjoy the flavor of hope. Thanks. @leena Naya Pakistan is a journey, there will be delays, it has to go through old mindsets and roadblocks but the key is to stay on track to achieve results. Change does not happen overnight, it takes courage and perseverance. Fabulous Mr. Khan As an Indian, this kind of rule with focus on education, not borrowing as well as concern for well being of animals- really impresses me. Wish you the very best If you succeed, we may be able to find peace in the region. @Socrates. Lets get the facts straight here, the guests were asked to arrive by 9:15 am, the oath ceremony was suppose to start by 9:30 am, but was delayed 30 minutes. There could be number of reasons, you went straight full force ahead to blame IK and PTI, take a breath brother, people have waited for hours stuck on a road because a VVIP motorcade was in town, you are complaining about 30 minutes. In his speech he missed the biggest point of Pakistan, Kashmir. Is some policy changing in Pakistan. Without that jow much sustainable the government is, a million dollar question. @Jk if imran khan can tackle the issue of corruption & attract foreign investment in pakistan then population growth of pakistan does not matter,also good increase in population of any nations make better source of human resources,more young population is needed to replace the old in the working force of any nation.population growth rate of pakistan has started declining,nowadays only a few people have "five children". Great speech. Hit every populous item in Pakistan. However, it lacked conversation on foreign policy, defence and civil/political rights. A heart felt speech well delivered! If only the nation can help the prime minister to rebuild the nation! He certainly has demonstrated that he understands the issues the nation is facing. He certainly has the gift of tenacity and laudable goals. Let us all pitch in to help him to help ourselves. Let us accompany him, on a long difficult road ahead, marching to get Pakistan free of internal corruption, external loans and external pressures - a country where the rule of law is never compromised. The nation has a new leader and a great opportunity. Godspeed, PM Khan! However, the biggest problem facing the nation today is the population explosion. Our country's resources are limited, yet the population grows exponentially. There needs to be an active campaign of population control / checks so that the country can thrive, not just survive. OMG...this is so inspiring. I, as an overseas Pakistani, will do my best to help Pakistan and support my Kaptan. If Imran follows on his projected path , rest assured that his dream of Naya Pakistan will be fulfilled . The peoples support from the grass root is required . Though an Indian, I wanted to watch this speech and I did - this is great opportunity for Pakistan to better the situation and support IK. Subcontinent needs good leaders now... we need to stop fighting and take care of our people. Excellent example for the Asean Priministers to get his principles. mIsalute EMRAN. @Dr Ahmad - Melbourne Nice comment but if you take a deeper insight it becomes crystal clear that faults lies with our people who, all these years, were caught in the cobweb of clan, beradari & tribal system in vogue, where these corrupt Sandra’s, Khans, Waderas and chudaries, call the shots & it was simple for leading political outfits to buy out their favors. Though it is still there but the demographic change in the pattern of voters, comprising of youth majority, has become a game changer, this time around. The youth of this country, by all accounts are frustrated & angry, & are not willing to bear this scenario where all venues leading to their prosperous future, be it education, employment & a dream of better living conditions, are either clogged or stolen by the forces of self serving of status quo. They have created a small but definitely worthwhile opening by using their democratic right & believe me, if the PTI did not deliver, leading to very turbulent times in near future. @Amjad Durrani Engineer USA Thank you my brother. I also believe in this dream for all the humanity suffering in Pakistan to end and also in the world. I'm doing my part by volunteering and speaking the people letting them know the truth is to support those leaders who wealth is in Pakistan, and never stand up with Zardari or Nawaz who have plundered our nations wealth for their own gains. Thank you once again for your comment, you guys are truly our great asset NICOP can really help us fill in Pakistan with all you guys expertise. Respect and much love my brother.